THE Post Newspaper has been defaulting on taxes since 2009 and President Edgar Lungu yesterday challenged diplomats accredited to Zambia to settle the Post Newspaper’s K53 million tax debt owed to Zambia Revenue Authority (ZRA) if they feel that the newspaper is being victimized. He said diplomats should refrain from meddling in Zambia’s internal affairs such as how ZRA should collect taxes on behalf of government because the collection of taxes in Zambia was a sovereign mandate of an independent revenue body, the ZRA. President Lungu told 45 diplomats at State House yesterday that the decision by ZRA to take over the assets of the Post Newspaper was an independent action. Following the Supreme Court judgment that ordered the newspaper to settle its tax debt and that the judicial proceedings had started as far back as 2009. President Lungu said it was not correct for diplomats to criticize Government over the Post Newspaper’s closure by ZRA, stating that the Supreme Court could not have decided to stay the matter because of the general elections in August. He said the issue of the Post owing ZRA in taxes had been there from 2009 and that when the Patriotic Front (PF) formed Government in 2011, it found the matter and questioned when would have been the right time for the courts to rule on the matter. Zambia’s tax system were the same who were condemning government over the decision by ZRA to take over the assets of the Post Newspaper for failing to pay tax. “Those of you, who feel the Post Newspaper is being victimized, let them raise money to pay ZRA and the matter will be cleared overnight. This issue of the Post Newspaper was there as far back as 2009 and when we came into power in 2011, we found it. Some of you are saying that the timing of the court’s decision is awkward. Tell me, when is the right time to do this? It is also worth noting that the judicial proceedings concerning ZRA and the Post Newspaper are not new. This matter cannot be stayed because of elections,” he said. President Lungu said it was important for Zambia’s cooperating partners and stakeholders to note that Zambia valued the doctrine of the separation of powers between the three arms of Government and that ZRA had the duty and responsibility to collect tax from the Post Newspaper without being reminded. 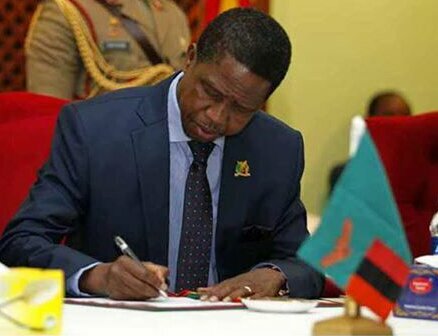 And President Lungu said Government was concerned with the security situation in the country following the recent incidences of violence among political parties. He said the political violence that had characterized campaigns in the recent weeks had the potential to harm the country’s reputation as a beacon of peace and stability in the region and the continent as a whole. President Lungu stated that Government had taken measures to ensure a peaceful environment prevailed so that all political parties could campaign freely and without fear of intimidation. “I have personally condemned violence and have been calling upon my party members and citizens to desist from violent acts. The Zambia police has been working hard to address the situation and they have been arresting perpetrators of violence regardless of one’s political party,” President Lungu said.